There are some things that as anglers we just can't resist. Such as an invitation to try out a neglected old farm lake "to see what's in it". The chances are it could be a real duffer; a puddle devoid of everything but sticklebacks and dragonfly nymphs, but there's always that chance. That pesky chance. So upon receiving one of these extremely rare opportunities, I couldn't refuse. 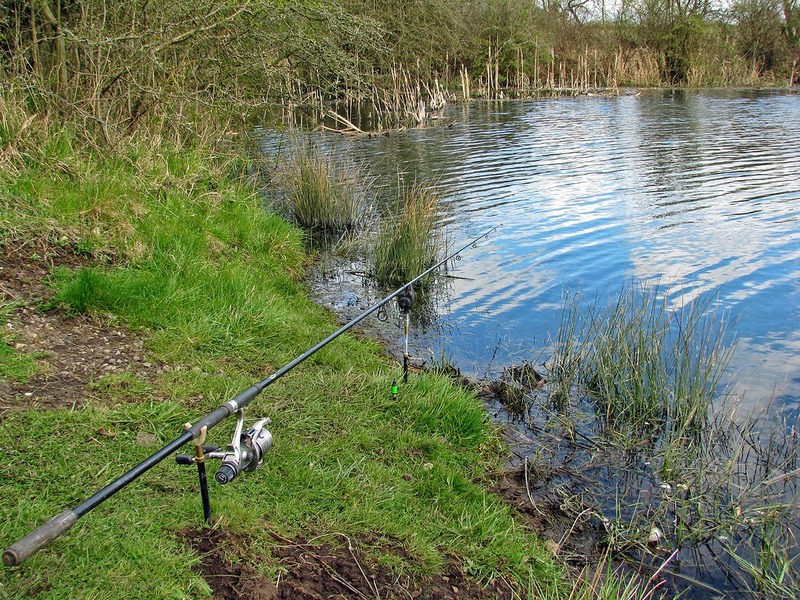 A farmer was investigating the possibility of selling the fishing rights to a couple of acre lake on his property, which had been neglected and unfished (bar the odd poacher) for years. A quick recce was all I could fit in initially, but I spotted a few carp up to high doubles, maybe even a twenty, plus a half-decent tench hanging in the shade of a fallen tree. I'd also spotted a lightning fast tail swirl in the margins that really shouted "pike" to me, so I made a mental note to visit properly the following spring. It was difficult to know what tackle to take with me because I wanted to get an accurate cross-section of the species present in the water, but I also hoped to catch the lakes largest residents - whatever they may be - to help the farmer to get interest from local angling groups. So I took the the whole gun rack! Armed to the teeth I was, with tackle for every species that could possibly swim in the lake. This scattergun approach, which often tempts my chaotic mind, usually leaves me with a complete lack of focus and thus, I miss out on catching fish by chopping and changing too much. However, on this occasion I knew I had to be versatile; it was pointless fishing for pike if none were present and it was pointless hoping for a specimen roach or rudd if it didn't contain those species. After my recce I'd decided my best chance of a specimen would be to mainly target the carp & tench, have an occasional chuck around with a lure, and have a dabble with maggots to see what else might reside in this mysterious water. I raked a few swims when I arrived and almost had to give up on my rake in a weedy corner. It hit a snag and went solid, no amount of pulling would shift it. I had to go wading through the overgrown, stinking silty margins to get an opposite angle of pull and thankfully I eventually got my rake back. Now I was in two minds; I had found a snag which may hold fish, but would the disturbance I caused by 15 minutes of tugging on a snagged rake have caused the fish to abandon this sanctuary? I opted to bait up this corner and rest it whilst I explored the other swims I'd raked. It was slow going for a while. I saw no signs of fish except for a few jack pike and a larger one of around 12lb, resting in the margins. I didn't need to catch these as I had a good visual confirmation of their presence, plus pulling a lure through the shallow margins they were laid up in would more likely spook them than tempt them to strike. My legered baits over the raked areas got no interest and I decided to have a bash with maggots on the float. I was aghast when after half an hour of this I'd caught nothing but a micro-perch. Still, it was another species I hadn't previously known was present. I later spotted some small rudd and possibly roach, but they were tiny and I decided not to focus on these any longer. So it came time to cast into the reed-fringed corner where I'd found the snag. 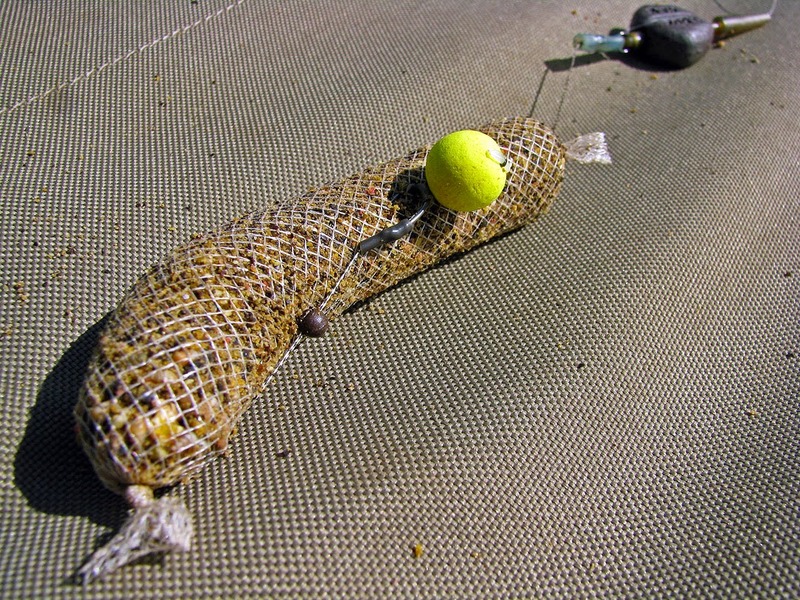 I had baited with some groundbait laced with a few mixed pellets, grains of corn, maggots, casters and broken boilies. Once again, the kitchen sink treatment! 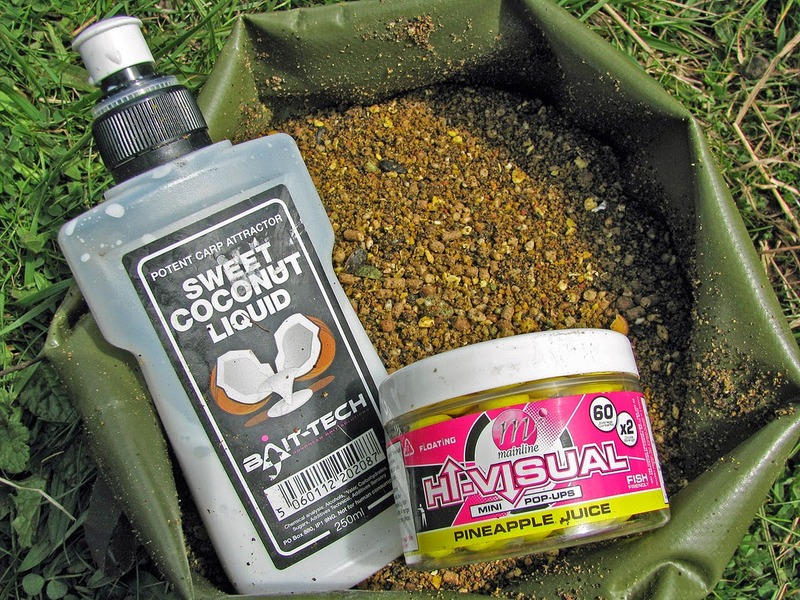 I liberally poured over some liquid coconut flavouring to appeal to the sweet tooth of any nearby tench or carp. 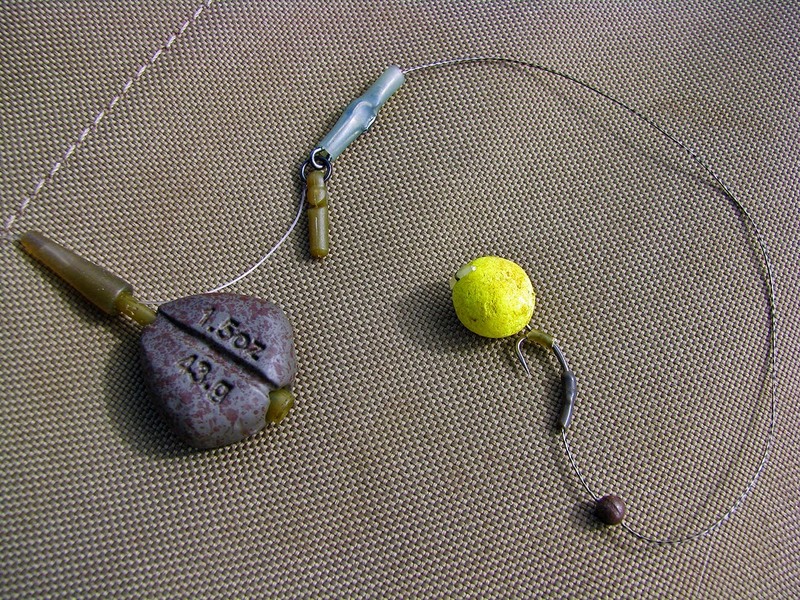 I then opted to fish an inline lead set-up to drop-off if it got snagged, with a short braided hooklink and a dynamite stick of the same groundbait mix added before each cast. Hookbait was a stack of real and fake corn on one rod (which was the "searcher" rod I cast around to other areas) and on the rig going into the corner I hair-rigged a 12mm pineapple popup. With the traps set, I waited and waited, gradually losing confidence that there was anything worth catching present. A passer-by stopped and chatted. He told me that over the winter there had been a gang of men on the water, up the trees dragging a large net through the lake! He had assumed they were the owners netting it to move the fish. I was assured by the farmer that this wasn't the case, so who knows where anything they caught ended up. Another venue? On the dinner table...? My heart sank. Was I fishing somewhere that had been poached to death? Would the carp & tench I saw the previous year have been removed by these unscrupulous individuals? Was this the reason that all I'd seen were small pike and small silver fish? It was early afternoon and I was running plans through my head of what venues I could move to, to fish in a similar way but actually have a chance of getting a bite. I decided to give things another hour and if nothing happened I'd drive half an hour or so to a club lake I'd always meant to get around to fishing. About fifteen minutes later the bobbin on the rod cast to the corner snag smacked the underside of the rod and the baitrunner hit warp speed! I clumsily fell sideways off my chair, probably out of shock more than anything, and picked up the rod as I laid on the floor. As I leapt to my feet the water was broken by the huge shoulders of a carp, which kited to my right with phenomenal pace, skirting reeds as it went. I gave it as much sidestrain as I dared, which was just enough to keep the fish swimming and not getting its nose into the reeds. Eventually the reedbed ended and a large bush was partly submerged on the far bank. I realised I had to gain some line because at its current trajectory, the carp would plunge straight into said bush. It knew where it was heading a long time before I did! So I pumped the rod and managed to gain some line which steered the fish just short of the bush, but it didn't let up the pace in the slightest. By now the fish had swum more than 180 degrees in an almost perfect curve and when it reached open water I realised that if it tried to complete the circle it would hit the reeds and submerged bushes round the corner to my right, in the near margin. I reeled for dear life, barely managing to keep up with the speed of the fish. I didn't gain enough line and the fish did indeed keep up its circular route and before I knew it, the carp was 20 feet from me, 3 feet from the bank, floundering just the other side of a small bush in the water. I managed to free my line from the reeds it had gone through to get there, by flicking the rod tip upwards, but the line was snagged in the bush. I had no choice but to go in with the net and hope the fish didn't try to bolt before I got there, or it was goodnight Vienna! This sounds simple, but there was a wild rose bush to circumvent and the water was far deeper than my wellies. 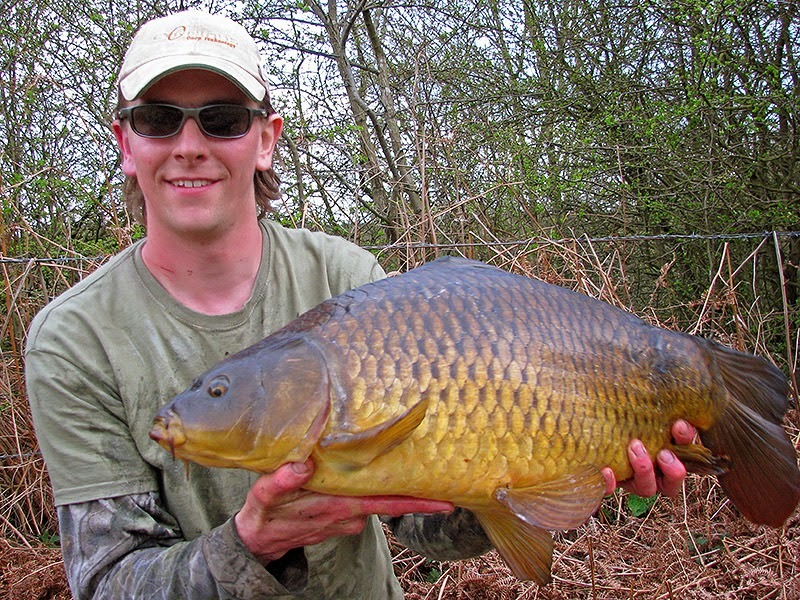 I went for it and in a few swift strides, I got my net round the back of the bush and enveloped the carp within it. Without hesitation I bit my mainline because this was the only way I'd free it. A bit of bushwacking got me and the fish safely back to the bank. I was scratched all over from the rose bush and my wellies were full of stinking silty water, but I cared little because I knew I had a PB carp in the net. 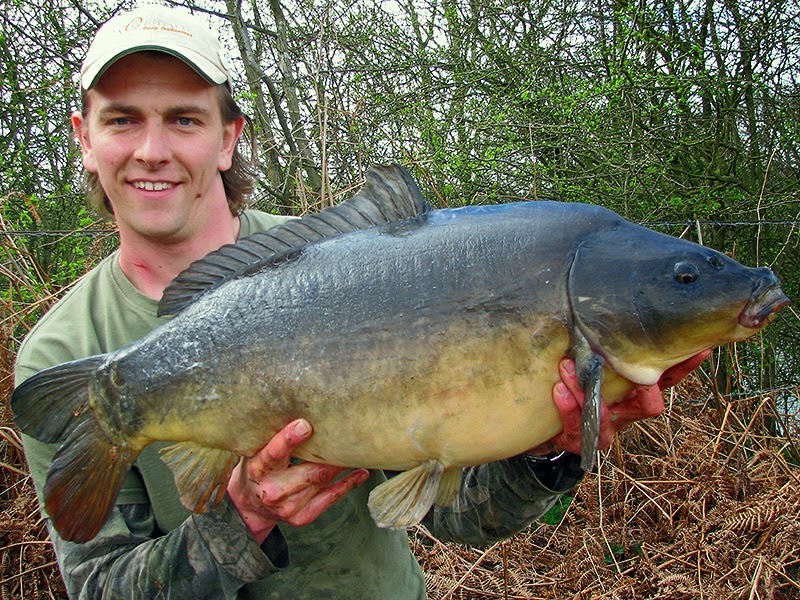 I used to fish for carp regularly, at local waters containing few fish above mid-doubles and hence, my PB hovered around mid-doubles before I lost interest with carp fishing in general and sought to pursue a wider range of quarry. I've limited my carp fishing in the past decade and a half to the odd bit of the methods I love best, stalking, float fishing and surface fishing. I stalked a fish just shy of 19lb on a worm a good few years ago and whilst it would have been great to have caught a twenty, I wasn't bothered about putting a campaign in to catch one, there are many species I care more about. After this huge disturbance I decided to rest this swim and I'd noticed some floaters I'd catapulted up the lake were getting some interest, so I spent an hour or so gaining their confidence and getting an idea of which the largest individuals were. There were two fish which looked mid to upper doubles and once I was happy they were taking well I made a cast. The wind was blowing down the centre of the lake and soon my rig was blown well out of the feeding area, so with my second cast I used the wind to my advantage, casting away from the fish and waiting for the bait and controller to drift over them. It worked a treat and within minutes I hooked one of the bigger pair. It was a much less eventful scrap than the first fish, owed partly to the shape of the common carp, which was very short and stumpy, with a very short tail wrist. 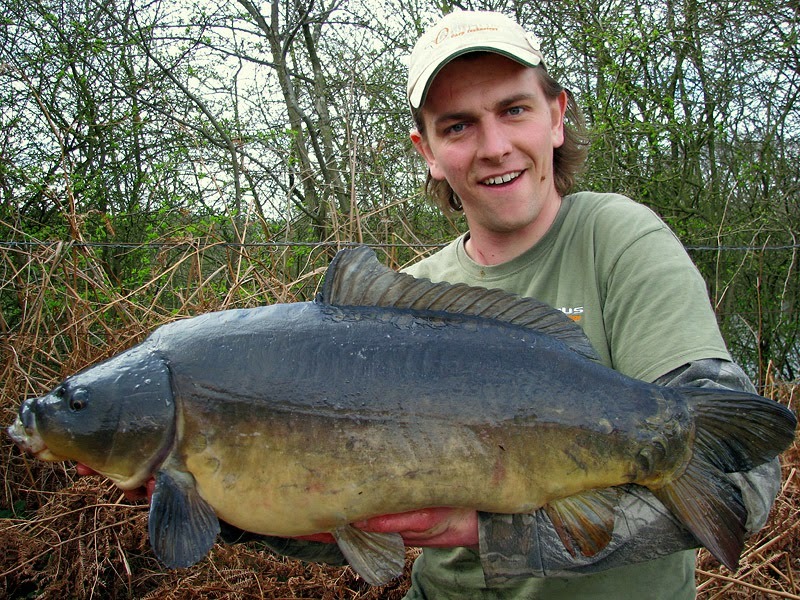 At 16lb 3oz it was a good fish off the surface and further proof of the lake's potential. 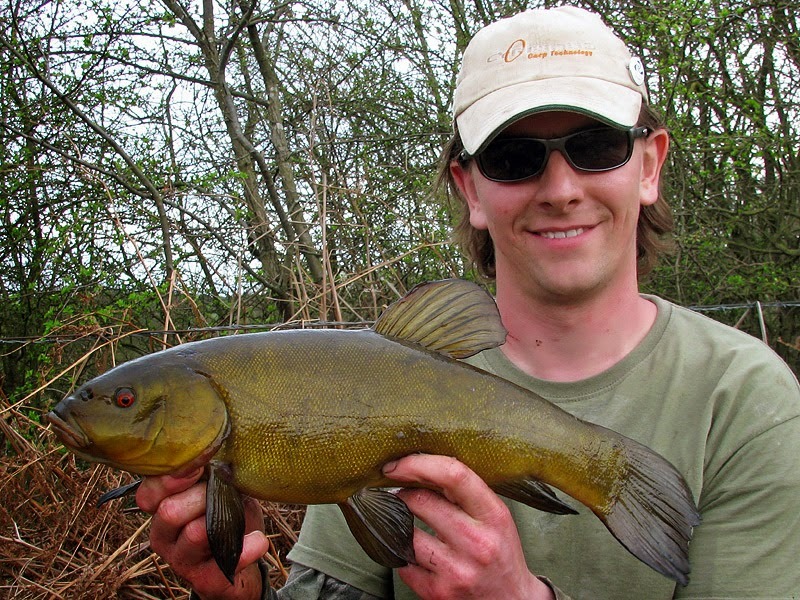 Further baits introduced in this swim failed to raise any carp, so I returned to my corner swim and within half an hour of casting I had a much more hesitant take on the pineapple pop-up, resulting in a tench just shy of 3lb. Another species that I could provide the farmer with photographic proof of. I fished on into dark and had no further action, but I was mightily satisfied with my efforts, especially after such a slow and unpromising start. It was an absolute dream come true to fish such a water which no-one else had access to. I think I showed what potential the place has and I'm fairly sure I landed its larger resident. Who knows, I had a great day but I have no plans on returning, however, I wish the farmer every success with opening the venue up to more people, as and when it happens.